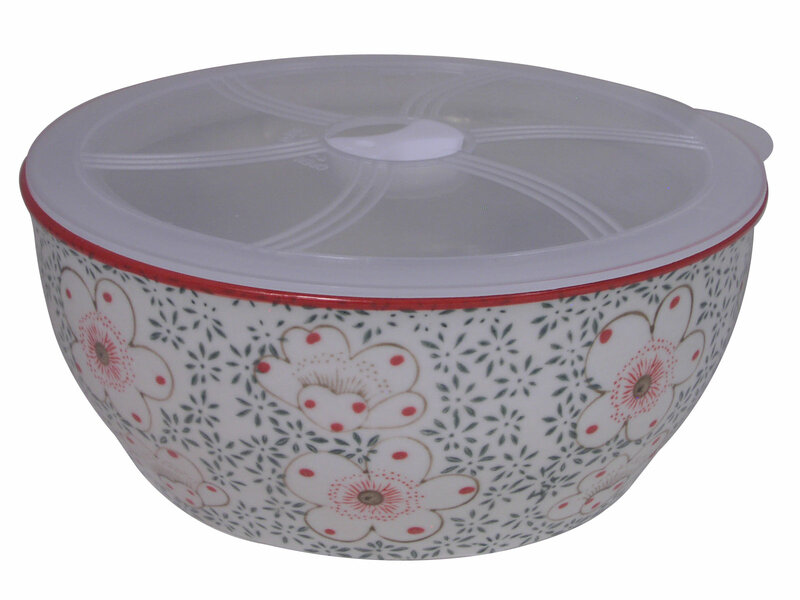 Made in China, this elegant cherry blossom bowl with lid is a great size for enjoying your favorite soups, stews, pastas, salads and desserts! Store this handy bowl in the refrigerator and heat up in the microwave when you're ready to enjoy your meal. Featuring several elegant outlined cherry blossoms in a light brown and pale red-orange, this bowl with lid also has a repeated pattern of small simplistic floral designs in a dark green all over the outside of the bowl and surrounding the cherry blossoms. The cherry blossom bowl is finally complimented by a dark red-orange on the top rim, making the elegant piece stand out even more. Perfect for enjoying left over meals, this bowl with lid is great for taking to school or work to enjoy during lunch time. Instead of bringing the same old plain glass Tupperware, make your meal stand out with this beautiful Asian bowl. Microwave and dishwasher safe, this bowl with lid is smooth and glossy and comes packaged individually in a box, ready for gift wrapping.